Greetings, dear readers! I hope this post finds you well! 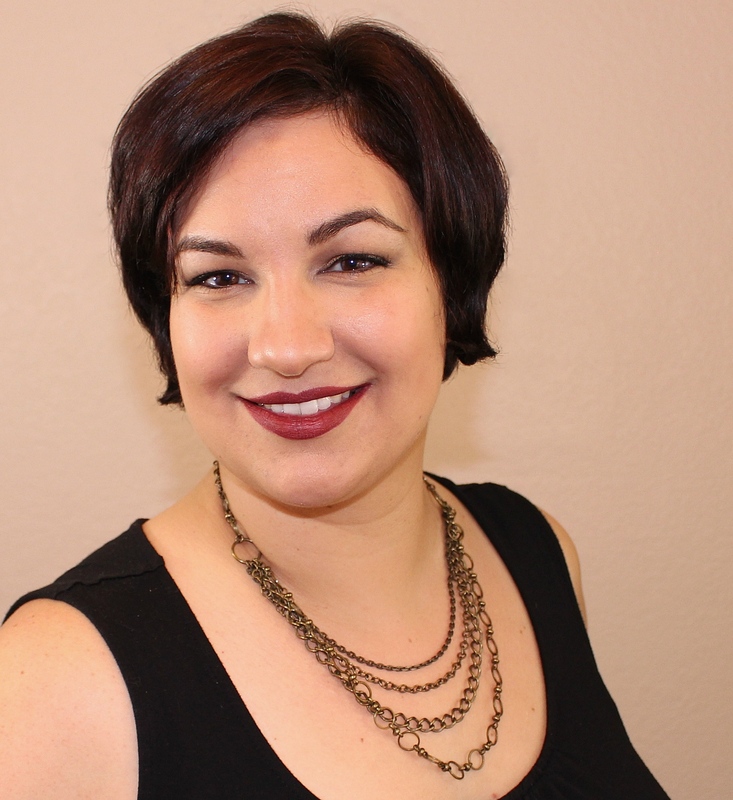 I have an exciting post to share with you so I'm going to keep the chitchat short and jump right on in to the good stuff. I am a member of the Facebook group Hella Holo Customs. In the off chance you aren't familiar with the group, let me fill you in! Each month, the group submits inspiration photos and everyone votes on their favorite photo they want to be used for polish inspiration. The top photos are then assigned to different indie makers who then work their magic at creating a holographic polish. The polishes are only available for members of the group for a limited time, but it's easy to join with just a click of a button. 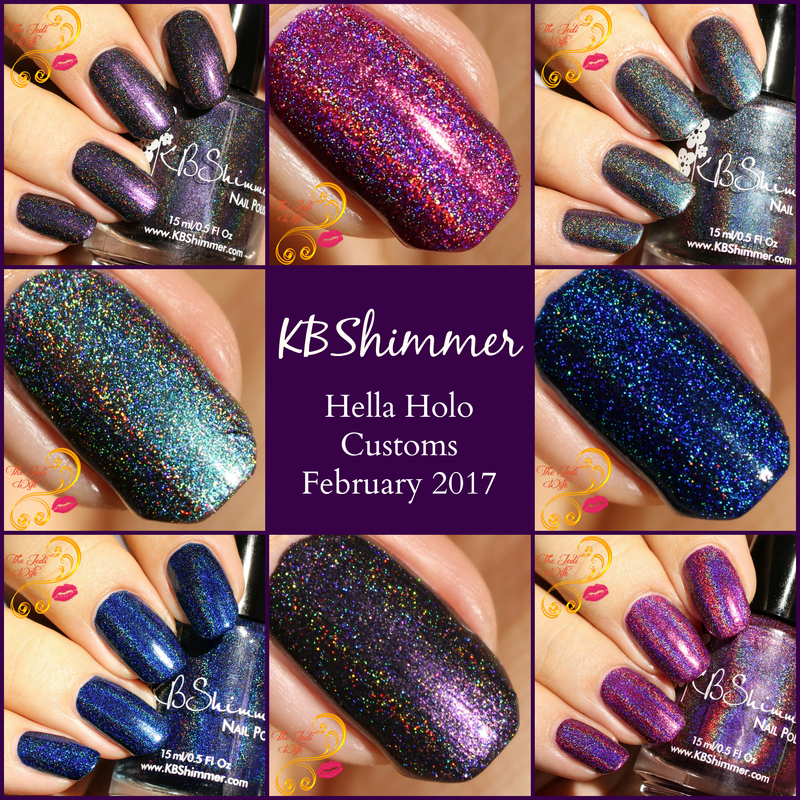 This month, the fabulous indie brand, KBShimmer, has created four stunning holographic polishes to decorate your digits and captivate your attention. These polishes are truly a site to behold, so let's jump in and check them out! When the sun sets, and the sky is just right, beautiful flashes of orange, fuchsia, magenta and dark purple fill the sky. This holo polish captures the bright fuchsia and magena tones of the sun's setting rays. This pink polish is packed with linear holo pigment for one of our strongest holos yet. Two coats recommended. Hello, gorgeous! I love a berry holo in general, but this one is something else entirely! It just dazzles with all the holo pigment and I just kept staring at my nails as I was swatching this beauty. One of the things I love about KBShimmer is the fantastic formula, so it should come as no surprise that the formula of Tall Pink of Water is perfection. It applied smoothly from the very first coat and is a must-have for any polish fan. Inspired by the shadows and fuchsia shades of sunset, Deep Hue Sea is a charcoal holo with strong violet pink shimmer, appearing almost a deep bruised purple in certain lights. In low lighting, it appears black, with pink and violet shimmer popping out, while in bright light, it looks more dark purple and pink with a strong linear holo. Two coats recommended. As much as I love my berry shades, I love these dark moody shades even more. I loved the vivid flashes of colour of violet as the light hit my nails, and with another winning formula, this is sure to win over any polish lover! Based on the glittery shoe, Shoe the Blues Away, a vibrant cobalt blue shade, is super holographic, with the holo pigment adding pops of lighter aqua against the deep blue color. Two coats recommended. I'm not sure why I don't wear blue holographic polish much any longer, but you can bet that I'll be wearing Shoe the Blues Away a lot! This polish is so striking on the nails! While I used two coats for opacity, I found the Shoe the Blues Away to be just a touch thicker than the other shades in this post, and if you tend to use heavier coats for application, you may find you only need to use a single coat for opacity. It still applies flawlessly and I am happy to recommend it to anyone! Based on the multichrome crystal photo that captures a metallic rainbow of colors, this truly unique multichrome was blended with several different pigments to shift from a teal green, to aqua blue, to fuchsia pink and purple. This spectrum of color is accented by a strong linear holo. This polish is very unique, and it looks different in varying forms of light. If soft, indirect light, you see more of the greens and purples, while brighter light brings out the blues and holo. In sunlight, the holo really shines and the polish looks teal and green, and sometimes it appears almost like a dark navy. It really is amazing how many personalities this polish has. Two to three coats recommended. While all the shades in this post are exquisite, there is an eloquence in the complexity of None of Your Bismuth that makes this the must-have shade if you absolutely have to limit yourself to one polish. There are many dazzling polishes on the market to choose from, but when something of this magnitude comes along, you break your "no buy" and pick it up, especially since it won't be available for long. Sadly, these photos don't come even close to the beauty and complexity of None of Your Bismuth as my camera was apparently rendered incapacitated by its grandeur. I'm currently working on a nail art design with this beauty, and I'm hoping to get more of the colour shifts in those photos. Trust me, this is beautiful! It is a little sheerer than the other shades in this post, but I still was able to reach opacity with only two coats. If your nails are very long or if you paint with very thin coats, you may find a third coat is necessary. These shades are officially available for purchase from the KBShimmer website now! Please note that prior to purchasing any of these shades, you must be a member of the Hella Holo Customs Facebook group; here is the link so you can come join in the fun! Once you have joined the group, you will be provided with the direct links to purchase these magnificent polishes. International buyers can purchase these polishes directly from the KBShimmer website. They will then be sent to the Hella Holo Customs admin team, Dawn and Aubrey, who will then ship them out to the correct recipients. International buyers in Canada, Sweden, or the UK are welcome to join the HHC International Group Buy Facebook group, linked here, and have their orders shipped directly from their country. Please note that these polishes are only available for purchase until February 28th. Again, these are only for members of the HHC Facebook group, and membership is verified. If you aren't already a member of the group, I hope you are willing to take the extra couple steps necessary to obtain these beauties. I can assure you, they are well worth it! What do you these of these stunning polishes from KBShimmer? Do you have a favorite? I'd love to hear from you! HOLY HOLO! These are beautiful! I'm loving Bismuth! I'm not usually a pink person, but Tall Pink of Water is stunning! Gorgeous photos and great review! Mahalo! Gorgeous swatches! I definitely need all of these, but that blue just kills me! I joined so that I can buy the polishes. I promised myself no more buying but how can I resist these? I just got my HHC order from their recent sale - I think I need another order! :) These are amazing! These all look like fun shades! I haven't purchased any HHC yet, but these are so tempting! I still only have one HHC! Everything that comes from that group is breathtaking and there's no way I could afford everything. Gorgeous! Love Tall Pink of Water! These are so gorgeous - I'm obsessed with None of Your Bismuth! I love all of these but the blue one has my heart! Wow, None of Your Bismuth is one of the prettiest polishes Ive seen!